Quest is highly appreciated from its prestigious users. 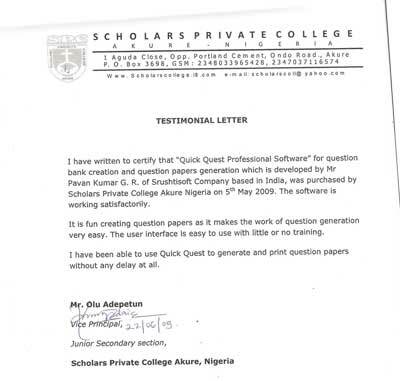 The testimony letters from our users (with authorized signatory) unveils the potential of Quick Quest to automate question paper creation process for the educational institutions. 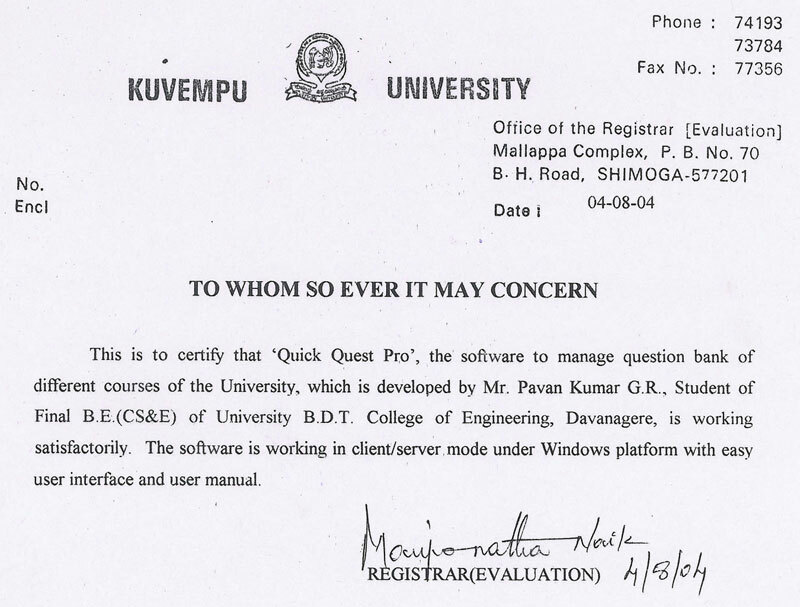 Kuvempu University is a young affiliating University in Karnataka. Established in 1987. - It has 57 Post-Graduate departments of studies in the faculties of Arts, Science, Commerce, Education and Law. - It also has outlying regional Post-Graduate centres at Davangere and Kadur. 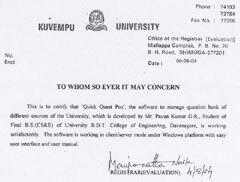 Kuvempu University official web site: http://www.kuvempu.ac.in/ Quick Quest remained at the center of the exam section of Kuvempu University, enabling users to create questions paper quicker than what they imagined. 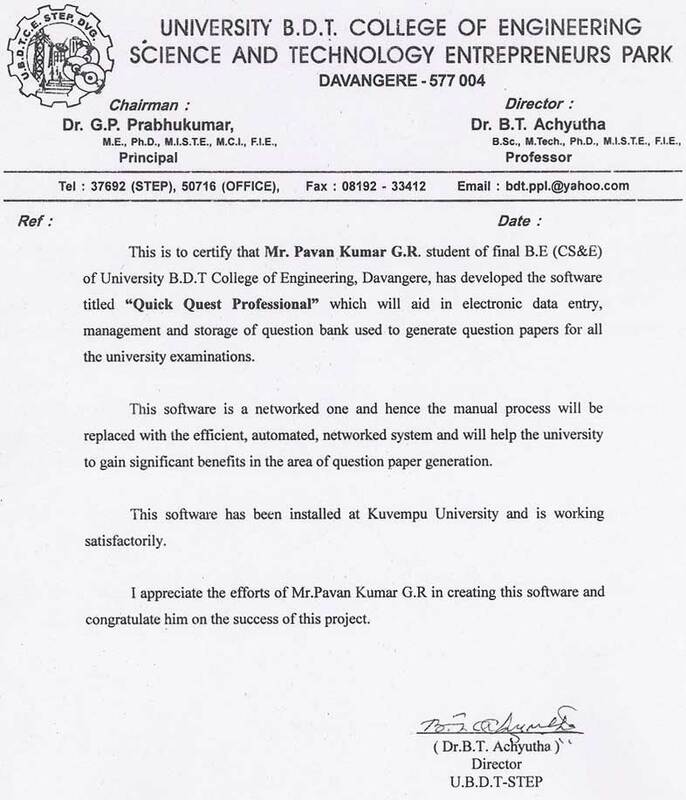 In an effort of providing secured, affordable, simple and powerful software for annual exam questions paper generation activity, Quick Quest proved its capabilities by performing up to the mark. 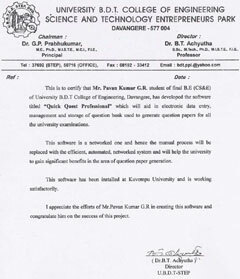 We received appreciation letters from University Registrar, Shimoga and Director of University B.D.T Engineering College, Davangere. Director of U.B.D.T College of Engg. "In one and half month, we have generated 35+ mathematics question papers without any problem!" 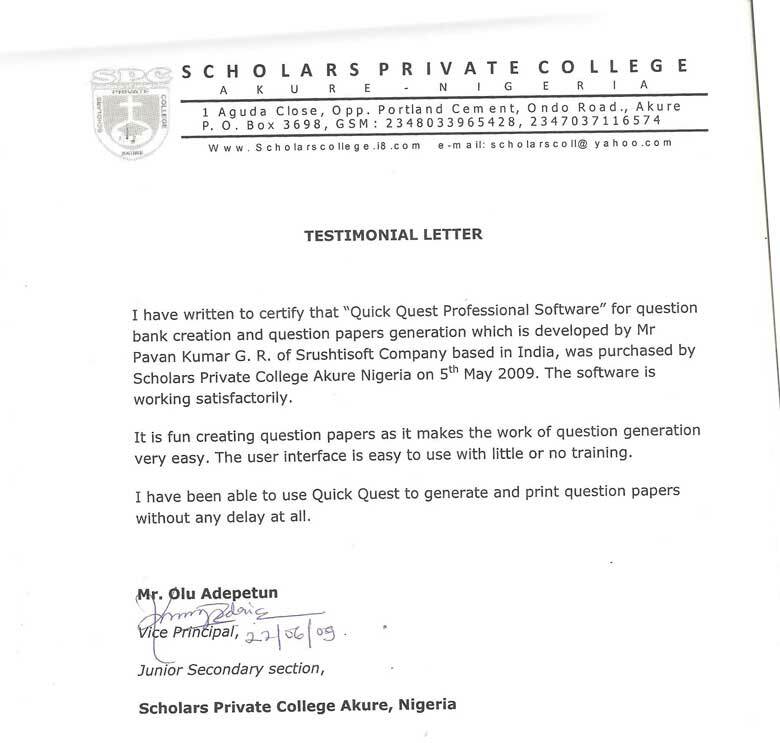 "We have ended our school tests and examinations for the term, and I have been able to use Quick Quest to generate and print question papers without any delay at all." "No school has ever used such software in Akure Nigeria"
"This software is a networked one and hence manual process will be replaced with the efficient, automated system and will help university to gain significant benefits.."
"This software is to manage question bank of different courses of the university ...with easy user interface and user manual." "Easy and intuitive to use, would be time-saving for teachers.."
"I have started data-feeding in QuickQuest. It's a Breeze !!!!!"